The Nilgiri Hills or the Blue Mountains is a captivating terrain where the incredibly beautiful abode of Ooty is perched at an altitude of 2286 m. Ooty also known as Udhagamandalam is the "Queen of hill stations" and the capital of Nilgiris district. It is one of the most popular tourist resorts in India. Nilgiris means "Blue Mountains". It is a land of picturesque picnic spots. Used to be popular summer and weekend getaway for the Britishers during the colonial days. It is situated at an altitude of 2,240 meters above sea level. An added attraction for the tourists to Udagamandalam is the mountain train journey on a ratchet and pinion track which commences from Kallar, near Mettupalayam and wends its way through many hair-raising curves and fearful tunnels and chugs along beside deep ravines full of verdant vegetation, gurgling streams and tea gardens. One of the reasons people like to visit hill stations is that, they not only offer a respite from the dust and pollution of the city but also give people a chance to see the undefiled beauty of nature. The green hills, the cascading waterfalls and sparkling brooks, all make the hill stations a delight for the eyes of the urban dweller. 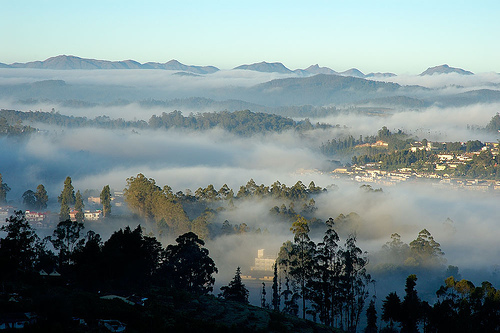 Ooty is an ideal hill station since it offers all this and much more. There are many places you can tour, such as the Botanical Gardens, Lamb's rock and Dodabetta Peak, on tours to Ooty India. Location: Ooty is located in the Western Ghats at a height of 2240 metres, Udhagamandalam is the headquarters of the Nilgiri district. The Toda tribe has been living here since time immemorial, but the credit for 'discovering' Ooty, making it accessible and developing it, surely goes to the British. Languages Spoken: Tamil, Malayalam, Kannadam and English. In the luxuriantly forested foothills of the Nilgiri, this 321 sq. km sanctuary is part of a much larger reserve (3000 sq km), which includes Bandipur and Wynad in neighbouring Karnataka and Kerala. The larger reserve ranges in vegetarian from semi-evergreen forests to swamps and grasslands. In Mudumalai, the mostly dense forest is home to chital, gaur, tiger, panther, wild boar and sloth bear. The park's wild elephant population, one of the largest in the country, supposedly numbers about 600, however you're more likely to see their domesticated brethren carrying out logging duties. The best time to visit Mudumalai is between February and June. Heavy rain is common in October and November and the park may be closed during the dry season. The garden is acquire an area 22 acres. There is surprisingly a fossil tree trunk of 20 million years. The garden consists of varieties of tree species, variety of ferns, fashioned beds laid out in an Italian style, grass carpet, multi coloured flowering plants, house ferns and orchids and nurseries. This garden is certainly going to take tourist's mind. Annual flower show is held here in May every year. Tamil Nadu Horticulture Dept takes care of this garden. 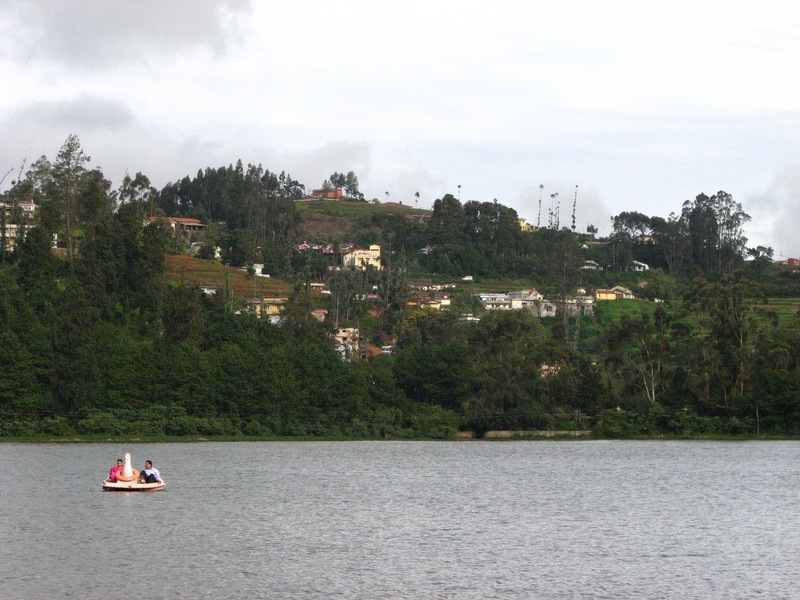 From just behind the Main Bus Stand (also near the Railway station) the famous Ooty Lake stretches, in an irregular 'L' shape, for about two kilometres in length and varrying distances in width. At the far end is the Boat House where all kinds of boats are available for hire from eight in the morning to six in the evening. During summer seasons, in May, boat races and boat pageantry are organised on two days at the lake which draw huge crowds. The boat houses is the place where the people reside and its also a great experience staying in a boat house. There are a few children parks where the tourists can halt and have a wonderful time with kids. The means of conveyance stays to be horses and ponies and horse ride is the favorite sport for anyone visiting the place. Centenary Rose park is located at Vijayanagaram – Udhgamandalam ( Ooty ) and is maintained by department of Horticulture of Government of Tamil Nadu. This garden has largest collection of roses among any Indian garden. This garden is located at an elevation of 2200-2400 from Mean sea Level. Average rain fall is 125 cm here. This beautiful rose garden was established in 20th May 1995 to commemorate the centenary of Udhgamandalam ( Ooty ) flower show ( 1896-1895 ). This garden is consist of five terraces in an area of 4.0 Hq and has more than 2800 variety of roses.